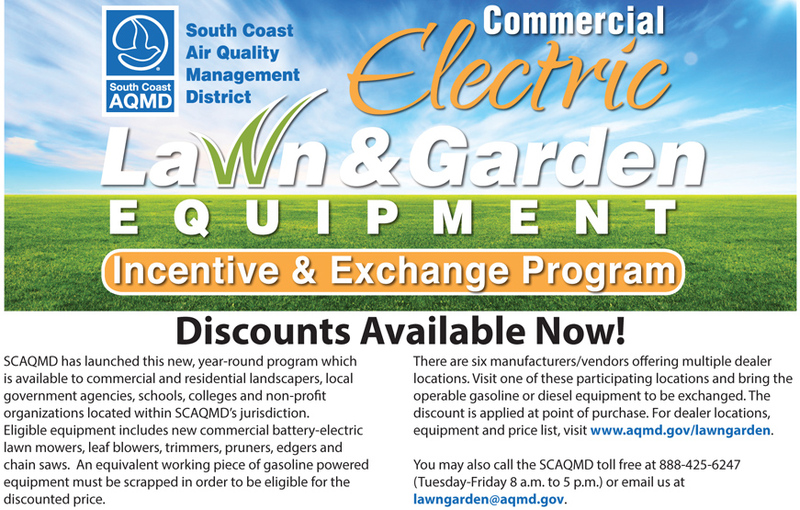 The South Coast Air Quality Management District has announced that $2.5 million in incentive funds are available to help commercial gardeners and landscapers, local governments, school districts, colleges and non-profit organizations buy new zero-emission, battery-electric commercial-grade lawn and garden equipment and scrap and replace their old, polluting gasoline- or diesel-powered equipment. Participants may receive up to 60 percent off the purchase price for new equipment. This program is not available to individual residents who are not gardeners or landscapers. Participants will be able to purchase qualifying equipment from ECHO, Husqvarna, Makita, Mean Green, Oregon and STIHL from authorized dealers in Riverside, Orange, Los Angeles and San Bernardino counties at a reduced price set by SCAQMD in exchange for an equivalent, operable piece of diesel- or gasoline-powered equipment. Manufacturers will accept and scrap the old equipment. Priority will be given to participants that are located in environmental justice or disadvantaged communities in the South Coast Basin. Operators of gasoline- or diesel-powered equipment are exposed to carcinogens such as benzene and butadiene, therefore increasing their cancer risks. Please visit www.aqmd.gov/lawngarden to view eligible equipment and dealer locations. There is no-pre-registration required to participate in this innovative program. This exchange program is funded through SCAQMD’s Air Quality Investment Program and U.S. Environmental Protection Agency’s Targeted Air Shed Grant.